A comprehensive guide to everything related to audio interfaces used for recording and live performance. One special feature is a detailed comparison chart of the major interfaces to allow you to easily see which ones have the specifications you need for your particular music production requirements. Audio Interface & Adapter Guide also has reviews of adapters specifically designed for use by guitarists - particularly ones which work with the iPad and iPhone like the Peavey AmpKit Link HD. 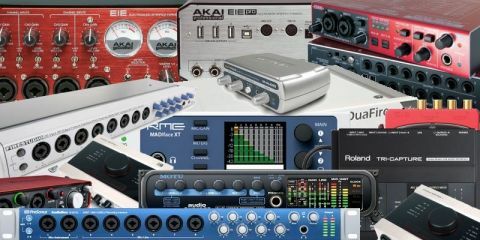 Whether you're a guitarist, electronic musician, producer, or engineer, you'll find this to be an incredibly useful resource when it comes to getting advice on the best audio interface for your particular requirements. Posted by Anonymous on Mon, 07/13/2015 - 23:53. I'd like to see a review of the iRig UA from IK Multimedia. It's the one that works on Android 4.2 and up.